Blog > What Happened to the Winner of ArtPrize 2009? Nicole Caruth is a freelance writer and curator living in New York and frequent contributor to the Art21 blog. ArtPrize hired Nicole to chronicle the 2009 event. Nicole’s thoughts and opinions are her own and in no way represent an endorsement or objection from ArtPrize toward an individual artist or venue. When I last contributed to this blog, the ten finalists of the first ArtPrize competition had just been announced. I left Grand Rapids almost certain that a painting could never speak to voting crowds as loudly as the table on chairs on the Blue Bridge or a seven-foot moose made out of nails. 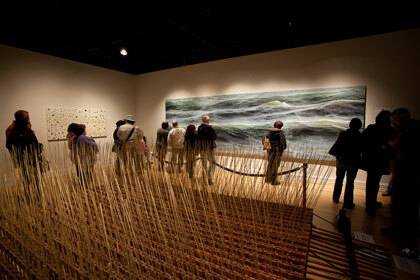 But here I find myself six months later looking at painted ocean waves in the studio of grand prize winner, and fellow Brooklyn resident, Ran Ortner. His three-panel painting, Open Water No. 24, now has a temporary home at the Grand Rapids Art Museum, where attendance has reportedly risen fifty percent since the piece went on view. Crowds to hear Ortner speak there in January were double normal capacity, too. It seems that Ortner has become something of a celebrity in Grand Rapids and beyond. While stardom and a whopping $250,000 of course have their benefits, it is clear that Ortner’s artwork is still what drives him. In New York, where art stars seem to pop up and disappear over night, losing their way in the limelight, Ortner’s unwavering thirty-year devotion to painting is as refreshing as the ocean itself. Below, the artist discusses the impact of ArtPrize on his life and work and why, after all these years and his latest success, he still thinks of himself as an “emerging” artist. 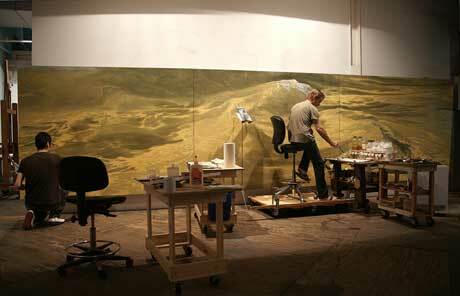 Ran Ortner and assistant in studio. Photo courtesy of Ran Ortner. Nicole J. Caruth: So, enquiring minds want to know, how has the ArtPrize award impacted your life? Ran Ortner: Ah…it’s hard to describe. There has been criticism, as there is in every program. People have asked, is this the way to foster or support the arts? Should there be a stipend over time? Or should there be smaller prizes over a larger area? There are a lot of ways to frame things and there are a lot of ways to execute things. I think there are pros and cons to every single approach. To the critics who say, “It’s not sustainable, it’s like winning the lottery,” yes, we all know that to have a successful life you have to have a flow of money. You can’t have a one time huge hit. But I can say that, for me, this has been such an incredible facility to be in. Outside of the emotional anxiety of making work, I had to put out psychic energy every month, asking myself, “How am I going to cobble together the financial resources to go for another three weeks before I panic again?” To now be able to apply all of my energy to my work is just exquisite, just incredible. I am still pinching myself. And ArtPrize is not just the cash award. It is also the amount of press, which reaches beyond local press. I’m getting calls from London, India, Associated Press—it’s a massive thing. In our contemporary society press is a very powerful tool, so it’s literally like stepping through a door to an alternate reality. NJC: Has there been a greater demand for your work? RO: Yes. I can’t meet the demand. NJC: What was the demand before compared to the demand now? RO: Well, I would get 4 or 5 emails a week before. I live sort of a solitary life. I love my studio life and I enjoy quite contemplative engagement, so I worked at keeping my contact with the outside world limited. I went from that to getting 200 emails a day. NJC: Let’s just back up. How did you end up participating in ArtPrize? Was it your dealer who brought you? RO: Yes. I was completely unaware [of ArtPrize]. When it came up, I was working toward another show that required an awful lot of effort. As an emerging artist you are trying to promote your work, make your work, and find space to show your work. I was putting a show together in Los Angeles and it was so exhausting and required so much. Tracy [Causey-Jeffery], my dealer, called and said that she had entered me into ArtPrize, my work had been accepted, and she asked if I wanted to do it. I thought to myself, “No, I’m busy.” Then I thought, “I know how I’ll get out of this. I’ll say I’m not going to do it unless I can do what I do, and that is large-scale work.” So, I said, “I’ll only do it if I can have a wall where the work can be seen properly and I can show a large piece.” Steve [Samson] agreed and I started working. NJC: You just called yourself an emerging artist. Do you still feel like you’re emerging? RO: Yeah, that’s a strange thing—I’m a very old Cinderella. [Laughter] But, yes, I feel like I’m a very slow learner. I feel like I’m just beginning to touch the edge of what’s possible in my work. …I’m not in the top tier. I’m not at Paula Cooper, Andrea Rosen, or Gagosian [galleries]. There’s no auction record of my work. I’m not in major institutions and that’s where my ambitions lie. NJC: You’ve already raised the criticisms of ArtPrize and one of them was that such a large amount of money, if awarded to a young emerging artist, should come with some form of mentorship. But you have been working for thirty years. In some ways, I feel like you were the ideal candidate for such critics. I’m wondering how you feel about the suggestion of career guidance. RO: It’s a difficult thing to address, to try to step outside one self. But I have been a guest professor at the Higher Institute for Fine Arts in Antwerp, Belgium and if I ever encounter a young artist who has any doubts about investing the next ten years of his or her life in his or her work, my advice is always to quit. If you have any capacity to quit whatsoever, most certainly do yourself an enormous favor and quit. If you have no capacity whatsoever to quit, and you’ve tried a million times, in a million different ways, and you still can’t quit, then you know it’s right for you. Look at examples, historically, when art has been forbidden, when people have been incarcerated and had limited capacity—they still found a way. It’s in us and it is of us. You can’t extinguish it. The buoyant aspect of who we are is large and insistent. …I heard some people complain that where my work was hung in ArtPrize did not give it good exposure. I say continue to do things over the next twenty years and you’ll find yourself in one or two places where your work is hung in a nice spot. I’ve been asked if the show I’m doing this fall is because of ArtPrize. It’s not. You just go forward. I’ve always had this faith that if you do, there will be moments when you will gain traction. “Open Water No. 24” in Old Federal Building during ArtPrize 2009. Photo courtesy of ArtPrize/Brian Kelly Photography. NJC: On the one hand, your painting in the ArtPrize competition might have benefited from being in the Old Federal Building, one of the professionally curated spaces. On the other hand, your work was surrounded by a lot of other good pieces. There was a lot of work in that room, including the large reed piece that sort of blocked your painting. RO: Yes, and I was terribly disappointed. You know, I’m working in the contemporary art world. I’m trying to make a mark. I moved to New York twenty years ago, specifically, with that goal. I’m terribly ambitious as an artist, and what is my great progressive avant-garde idea? “I’m going to paint the sea.” [Laughs] But what I’m trying to do is bring enough gravitas and contemporary immediacy to this thing to make it relevant. I want it in this austere, kind of artificial white cube, and then boom, the awakening of this ancient thing that’s so immediate and so new in every moment, the same way the dance of fire is always immediate, as old as that thing is. If we quiet ourselves enough to engage we can just see [the ocean] is incredible in its immediacy, and the continual opening aspect of life begetting itself. I want this. I want the pulse of the sea to register and having a lot of things around the work takes it to a different place, it puts it in the pastoral context. I was thrilled that I got a wall where I could do a large-scale work and show my sense of grandeur. But when I saw it I was terribly disappointed. My friend Norman [Mooney] was trying to placate me. He was like, “Man, it’s a good painting. People will see it. Don’t worry.” I was like, “Don’t placate me.” So, he’s been laughing at my success the whole way. NJC: Were you watching the voting polls early on? RO: Yes. What I found fascinating was that, early in the competition, people would vote their fancy. They would say, “Oh, I like that. That’s cool,” in this very caviler and off-hand vote. But then what happened is something that I see in my studio. My friends will come in, look at my work, and say, “Oh, that’s my favorite, I love that one.” Or “If I could have any of them, I’d have that one.” But a collector comes in at an entirely different tempo. They are coming from a different register. They are investing with more of who they are. They’re establishing who they are in the context of the work. Establishing their own taste by putting their stamp of approval on something and parting with resources. All of these things require a different kind of consideration and the level of consideration is apparent. It takes much more time and it is a much more deliberate process. I saw the same thing happen with ArtPrize. Once the top ten [finalists] were established I went back to Grand Rapids. I could see that people were slowing down, and considering how their vote reflected Grand Rapids as a community, and what they really felt had value as art. That was fascinating. I could see a groundswell effect. When I made the top ten, I didn’t have any money to go out to Grand Rapids. I was back in my studio working for my next project. My collector comes in and says, “Ran, something is going on. You made the top ten. It’s pretty extraordinary. You have to go out and see what’s happening.” He bought me a ticket, gave me some spending money, and said, “Go.” I went out and each day the audiences got larger and larger. I had twenty people in tears who said they felt something heavy, ominous, powerful, and so beautiful and tender [in my work] at the same moment. I’ve never come across anyone working in the public sphere, in the arts, who has not had a longing to reach people. I’ve read so many biographies, and we all have this longing to connect. I’ve never known an artist who only wants to connect with an intellectual elite, a very small fragment of our society where one’s merit needs to be proven. Now, all of us who are ambitious want that as well. And all of us who go through a process of engaging in something [like art making] are fully aware of how much we’re chastened by education, by refining our impulses and our thinking and being able to consider deeper exploration. I love the philosophical, intellectual framing of things. I think it’s incredibly rich. But I also know that if we live a life that is only framed in philosophical constructs, we are missing a profound engagement with the rich, dynamic reality of life. 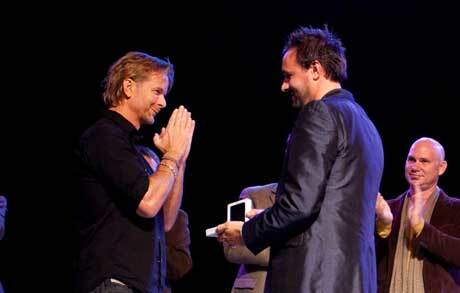 Rick DeVos gives Ran Ortner ArtPrize 2009 trophy . Photo courtesy of ArtPrize/Brian Kelly Photography. NJC: You’ve expressed that you are able to place more energy into making work since winning the prize. Has the prize changed the way that you and your assistants work in the studio? RO: Well, I never had assistants before. That’s ridiculously wonderful. To extend yourself through the energy of people who are helping you is such a gift. I was able to be an artist when I was dirt poor and I’m able to do that now with resources. That is exquisite. It has taken a lot of heaviness out of my soul. I think what we have to learn from deprivation is very limited. I think struggle is common in our notion of “paying your dues.” And, yes, there is that. But at a certain point we need to be supported. It is just so lovely to be supported …You cannot give the fullness of your life to your work if a large percentage of it is spent on survival. I can just feel the energy. The acceleration is exciting, because you see the world appearing quicker. What you’re pushing for happens faster. NJC: How do you approach a canvas? RO: I have made a scientific, calculated, intense investigation into process because I want the full dynamic range of tools possible to facilitate what I do. I have found that one of the most useful sources of information in painting are the technical bulletins coming out of the National Gallery in London, as far as a real exploration of how paint layers develop and their optical effects. I make a lot of my own paints. Every color has its own life and its own possibility. What goes into a color and type of oil, how long that oil has been cured and what kinds of processes have been used to cure it, which oils dry faster and yellow less—all of these things are the range I work within. I want the lushness of Velasquez, the immediacy and tenderness of Rembrandt, and the contemporary now that lives in El Greco. I’m also terribly compelled by contemporary art. Joseph Bueys, Lucio Fontana, and James Turrell [for example]. But I don’t distinguish periods. I don’t see a difference. NJC: How familiar were you with Grand Rapids before? And do you feel a connection to that community now? RO: I was not familiar with Grand Rapids before. …When I spoke at the Grand Rapids Art Museum there were 400 or 500 people in the auditorium and the same number of people again in the lobby. Celeste Adams, the director, said, “The strange thing here is that you’re a star and we don’t have that in our world.” I thought, “No, what’s happened is that the community has connected to something that is theirs.” The fact that people have voted and endorsed something is a kind of ownership, which rarely happens. That’s a wonderful side bar to this whole [competition], it allows people to have a personal investment in art. It’s incredible to witness that. When I stand in front of my painting at the museum, it’s not really my painting anymore. It has its own life and it is out there doing its thing. 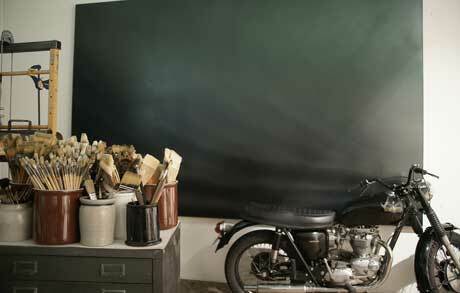 Ran Ortner’s studio. Photo courtesy of Ran Ortner. NJC: Do you have any criticisms of ArtPrize? Is there anything you hope would change in the coming years? RO: I know that no one wants to see it evolve into this massive spectacle that is a flea market, where people design floats and fireworks to get an immediate reaction of response instead of something that is deeply compelling. It is a social experiment and when you decide to allow the little regulation there is in this structure, there’s a lot that can run amok. There’s also a wonderful capacity for it to really mirror who we are as a society. I love what Margaret Mead said: “Culture is personality writ large.” In Grand Rapids, people are writing large, collectively. How they respond to a whole range of art, from paper airplanes being flown off buildings to the whole dynamic of what’s going on there. I like the idea that there are some shows that are curated and some that are very loosely thrown together. I think this range is quite lovely, and I think it’s what makes the whole thing a blast. We don’t know what’s going to happen next. NJC: Will you participate in ArtPrize again? RO: I don’t know. I don’t know if there will be a context or a time when that will feel right to me or not. NJC: What’s on the horizon for you now? RO: I have a show in the fall titled Deep Water. It will be three paintings, each of them six feet by twenty-four feet. I’m really excited. I feel like I’m getting somewhere with the deep mystery of this dynamic thing that is moving water. I continue to find it incredibly compelling. I feel like I’m getting closer all the time, and closer to it with this show than I’ve ever been. NJC: Is there anything else you would like to say? RO: If I’m given a moment to speak and not asked a question, what I want to say is thank you. I’m so incredibly grateful and touched. Anything that I can say sounds small, because the feeling that I have when I get up in the morning and just go to work without all of that heaviness of the financial struggle is beyond anything I dreamt of. I feel a tremendous sense of wanting to clarify that my work is worthy, that I’m worthy. And I know that’s something I could never claim. Only the work has the opportunity to determine that, as something that lives outside of me. MEDIA NOTE: Permission is granted by ArtPrize to reprint any portion or the entirety of the above interview.